The Citrus County Government has a Health and Wellness program for their 700+ employees, all were welcome and encouraged to participate in the walking challenge. To participate in the challenge, employees needed to form a team of 2-12 members. Each individual participating in the challenge was to count the amount of steps they took from wake to sleep over a 6 week period (we assume using pedometers or some other tool to assist). Team captains collect step logs from the team members and a leader board is updated weekly with the amount of steps each team has to date. The total steps from each person within the team is averaged amongst the entire team (meaning a 2 member team with 1,000 steps each will beat a 6 member team with 300 steps each) ensuring a level playing field for teams of varying sizes. 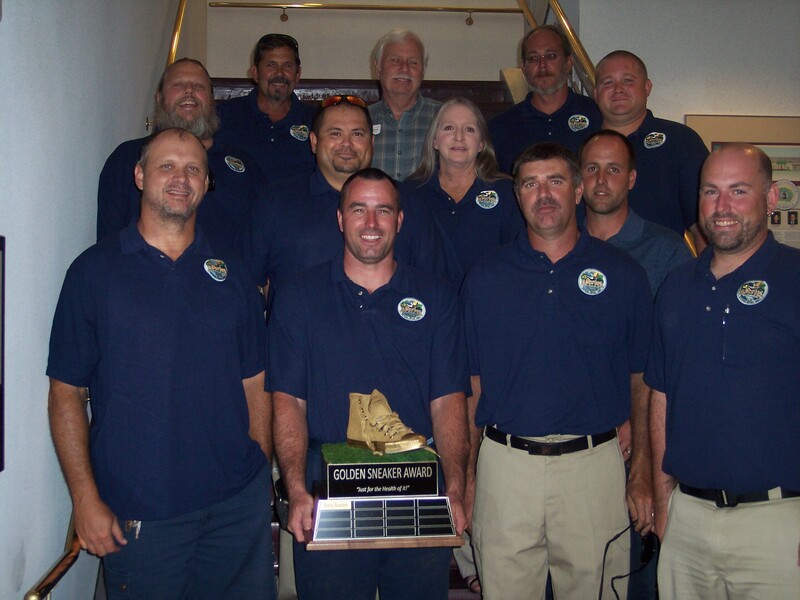 The team with the highest averaged amount of steps at the end of the 6 week period is deemed the winner and is awarded the Golden Sneaker until the next team wins and takes the sought after prize into their possession. HR Administrative Director, Debbie Weber, worked closely with us to create the perfect Far Out Award. With such a large amount of employees, we knew the award had to make a big statement, something that would really stand out and become a highly coveted incentive to promote participation in the walking challenge while still working with a budget. Debbie was imagining an old, worn-out, classic-style sneaker, something like a Converse Chuck Taylor All Star. We got the sneaker, went to work to make it look worn and used (that was a fun challenge) and then painted it gold. We got the perfect wood base and covered it with artificial grass turf, then secured our Golden Sneaker to the top. Debbie wanted the award to be perpetual so the winning team names could be added on the award as the Golden Sneaker is passed along from challenge to challenge, so we engraved and added the perpetual plates and the award was complete! Debbie got back to us recently after the first challenge to send us a picture with the winning team, the “Booty Busters.” The team looks great, fit and happy with their Far Out Award!